Communications equipment technicians install, test, maintain, troubleshoot, and repair a wide variety of telephone and radio equipment used to transmit communications—voices, data, graphics, and video—across long distances. This does not include, however, equipment that handles entertainment broadcast to the public via radio or television signals. Most communications equipment technicians work in telephone company offices or on customers’ premises. In the United States, approximately 222,000 people work as communications equipment technicians. Alexander Graham Bell patented the first practical telephone in 1876. By 1878, a commercial telephone company that switched calls between its local customers was operating in New Haven, Connecticut. For many years, telephone connections were made by operators who worked at central offices of telephone companies. A company customer who wanted to speak with another customer had to call the operator at a central office, and the operator would connect the two customer lines together by inserting a metal plug into a socket. Today, automatic switching equipment has replaced operators for routine connections like this, and telephones carry much more than voice messages between local customers. Vast quantities of information are sent across phone lines in the form of visual images and computer data. Furthermore, telephone systems today are part of larger inter connected telecommunications systems. These systems link together telephones with other equipment that sends information via micro wave and television transmissions, fiber optics cables, undersea cables, and signals bounced off satellites in space. High-speed computerized switching and routing equipment makes it possible for telecommunications systems to handle millions of calls and other data signals at the same time. Although specific duties vary, most communications equipment technicians share some basic kinds of activities. They work with electrical measuring and testing devices and hand tools; read blue prints, circuit diagrams, and electrical schematics (diagrams); and consult technical manuals. The following paragraphs describe Just a few of the many technicians who work in this complex industry. Central office equipment installers, also called equipment installation technicians, are specialists in setting up and taking down the switching and dialing equipment located in telephone company central offices. They install equipment in newly established offices, update existing equipment, add on to facilities that are being expanded, and remove old, outdated apparatus. Central office repairers, also called switching equipment technicians or central office technicians, work on the switching equipment that automatically connects lines when customers dial calls. They analyze defects and malfunctions in equipment, make fine adjustments, and test and repair switches and relays. These workers use various special tools, gauges, meters, and ordinary hand tools. PBX systems technicians or switching equipment technicians work on PBXs, or private branch exchanges, which are direct lines that businesses install to bypass phone company lines. PBX systems can handle both voice and data communications and can provide specialized services such as electronic mail and automatic routing of calls at the lowest possible cost. PBX installers install these systems. They may assemble customized switchboards for customers. PBX repairers maintain and repair PBX systems and associated equipment. Many of these workers are also now installing voice-over Internet protocol systems—which allow users to make voice calls using a broadband Internet connection. Maintenance administrators test customers’ lines within the central office to find causes and locations of malfunctions reported by customers. They report the nature of the trouble to maintenance crews and coordinate their activities to clear up the trouble. Some maintenance administrators work in cable television company offices, diagnosing subscribers’ problems with cable television signals and dispatching repairers if necessary. They use highly automated test-boards and other equipment to analyze circuits. They enter data into computer files and interpret computer output about trouble areas in the system. Many workers in this group are concerned with other kinds of communications equipment that are not part of telephone systems. Among these are radio repairers and mechanics, who install and repair radio transmitters and receivers. Sometimes they work on other electronics equipment at microwave and fiber optics installations. Avionics technicians work on electronic components in air craft communication, navigation, and flight control systems. Signal maintainers or track switch maintainers work on railroads. They install, inspect, and maintain the signals, track switches, gate crossings, and communications systems throughout rail networks. Instrument repairers work in repair shops, where they repair, test, and modify a variety of communications equipment. 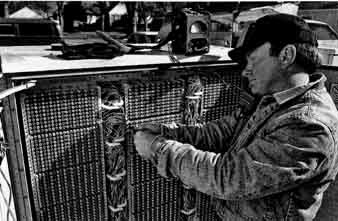 A technician troubleshoots a problem with a circuit box. Most employers prefer to hire candidates with at least some post- secondary training in electronics. So to prepare for this career, you should take computer courses, algebra, geometry, English, physics, and shop classes in high school. Useful shop courses are those that introduce you to principles of electricity and electronics, basic machine repair, reading blueprints and engineering drawings, and using hand tools. Most telecommunications employers prefer to hire technicians who have already learned most of the necessary skills, so consider getting training in this area either through service in the military or from a postsecondary training program. Programs at community or junior colleges or technical schools in telecommunications technology, electronics, electrical, or electromechanical technology, or even computer maintenance or related subjects, may be appropriate for people who want to become communications equipment technicians. Most programs last two years, although certificates in specific areas often can be obtained through a one-year program. Useful classes are those that provide practical knowledge about electricity and electronics and teach the use of hand tools, electronic testing equipment, and computer data terminals. Classes in digital and fiber optic technology are also beneficial. Applicants for entry-level positions may have to pass tests of their knowledge, general mechanical aptitude, and manual dexterity. Once hired, employees often go through company training programs. They may study practical and theoretical aspects of electricity, electronics, and mathematics that they will need to know for their work. Experienced workers also may attend training sessions from time to time. They need to keep their knowledge up to date as new technology in the rapidly changing telecommunications field affects the way they do their jobs. Some workers in this field must obtain a license. Federal Communications Commission regulations require that anyone who works with radio transmitting equipment must have a Global Maritime Distress and Safety System (GMDSS) license. In order to receive a license, applicants need to pass a written test on radio laws and operating procedures and take a Morse code examination. Certification for technicians is available from the National Association of Radio and Telecommunications Engineers and the Society of Cable Telecommunications Engineers. To receive certification, you’ll need a certain amount of education and experience in telecommunications, and you’ll have to pass an examination. You’ll need strong mechanical and electrical aptitudes, as well as manual dexterity. Keep in mind, too, that you’ll need to be able to distinguish between colors because many wires are color-coded. You should also have problem-solving abilities and the ability to work without a lot of direct supervision. Math and computer skills are also very important; you’ll also need to be able to interpret very technical manuals and blueprints. You’ll be expected to keep accurate records, so you’ll need to be organized. In high school, you can begin to find out about the work of communications equipment technicians by taking whatever electronics, computer, and electrical shop courses are available, and also other shop courses that help you become familiar with using various tools. Teachers or guidance counselors may be able to help you arrange a visit to a telephone company central office, where you can see telephone equipment and observe workers on the job. It may be possible to obtain a part-time or summer-helper job at a business that sells and repairs electronics equipment. Such a job could provide the opportunity to talk to workers whose skills are similar to those needed by many communications equipment technicians. Serving in the armed forces in a communications section can also provide a way to learn about this field and gain some useful experience. Approximately 222,000 people work as communications equipment technicians in the United States. Local and long-distance telephone companies and manufacturers of telephone and other electronic communications equipment employ communications equipment technicians. Work is also available with electrical repair shops and cable television companies. Beginning technicians can apply directly to the employment office of the local telephone company. Many times, it's necessary for newly hired workers to take a position in a different part of the company until an opening as a technician becomes available. However, telephone companies have been reducing the number of technicians they need in recent years, and competition for these positions is especially heavy. Information on job openings in this field may be available through the offices of the state employment service and through classified advertisements in newspapers. Because many communications equipment technicians are members of unions such as the Communications Workers of America (CWA) and the International Brotherhood of Electrical Workers, job seekers can contact their local offices for job leads and assistance, or visit the CWA Web site. The Personal Communications Industry Association also offers free job listings on its Wireless Jobnet online. Graduates of technical programs may be able to find out about openings at local companies through the school’s career services office or through contacts with teachers and administrators. The advancement possibilities for communications equipment technicians depend on the area of the telecommunications industry in which they work. Because of changes in equipment and technology, workers who hope to advance will need to have received recent training or update their skills through additional training. This training may be offered through employers or can be obtained through technical institutes or telecommunications associations. Advancement opportunities in telephone companies may be limited because of the fact that many telephone companies are reducing their workforces and will have less need for certain types of workers in the future. This will result in fewer positions to move into and increased competition for more advanced positions. However, some workers may be able to advance to supervisory or administrative positions. Many workers can advance through education resulting in an associate’s or bachelor’s degree. Workers who have completed two- or four-year programs in electrical or telecommunications engineering programs have the best opportunity to advance and can become engineering technicians and technologists, engineers, or telecommunications specialists. Earnings vary among communications equipment workers depending on their area of specialization, the size of their employer, and their location. The U.S. Department of Labor reports that median hourly earnings for telecommunication equipment installers and repairers were $25.21 in 2006. A technician earning this amount and working full-time at 40 hours a week would have a yearly income of approximately $52,430. The lowest paid 10 percent of telecommunications equipment technicians earned less than $14.96 per hour (approximately $31,110 yearly); the highest paid 10 percent earned more than $32.84 per hour (approximately $68,310 annually). The Department of Labor also reports that the 2006 median hourly wage for radio mechanics was $18.12. The annual income for a technician working full-time at this pay rate would be approximately $37,690. At the low end of the pay scale, 10 percent made less than $10.94 hourly (approximately $22,760 per year); at the high end, 10 percent made more than $28.54 hourly (approximately $59,360 annually). Most workers in this group who are employed by telephone companies are union members, and their earnings are set by contracts between the union and the company. Many currently employed communications equipment technicians have several years of experience and are at the higher end of the pay scale. Most workers in this field receive extra pay for hours worked at night, on weekends, or over 40 hours a week. Benefits vary but generally include paid vacations, paid holidays, sick leaves, and health insurance. In addition, some companies offer pension and retirement plans. Communications equipment technicians usually work 40 hours a week. They may have to work at night, on weekends, and on holidays because telecommunications systems must give uninterrupted service and trouble can occur at any time. Central telephone offices are clean, well lighted, and well ventilated. Communications equipment technicians may also work on site, which may require some crawling around on office floors and some bending. Even if these workers are running cables, they aren’t likely to be doing much heavy lifting; machinery assists them in some of the more strenuous work. These workers may work alone, or they may supervise the work of others. Some communications equipment technicians also work directly with clients. The work can be stressful, as technicians are often expected to work quickly to remedy urgent problems with communication equipment. Some technicians who work for large companies with clients nationwide must also travel as part of their jobs. The U.S. Department of Labor predicts that employment for communications equipment technicians will decline through 2014. Nevertheless, job availability will depend on the technician’s area of specialization. For example, technicians working as central office and PBX installers should find numerous job opportunities, in part because growing use of the Internet places new demands on communications networks. On the other hand, employment for radio mechanics and other installers is expected to decline as pre-wired buildings, the replacement of two-way radio systems with wireless systems, and extremely reliable equipment translate into less need for maintenance and repair. New technology relies on transmission through telecommunications networks rather than central-office switching equipment. There are far fewer mechanical devices that break, wear out, and need to be periodically cleaned and lubricated. These networks contain self-diagnosing features that detect problems and , in some cases, route operations around a trouble spot until repairs can be made. When problems occur, it's usually easier to replace parts rather than repair them. Competition for existing positions will be keen, and workers with the best qualifications stand the best chance of obtaining available jobs. To learn about issues affecting jobs in telecommunications, contact or visit the CWA’s Web site.